My favorite type of gear, the mighty VNA, king of the RF instruments. This one had a problem at low frequencies and a damaged centerpin from the port 2 N connector. 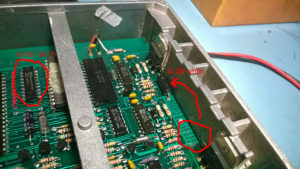 The LF problem was a combination of a power supply problem and a production fault from one of the sma (on rigid coax) connectors. Two of these calibrators were dead. One probably when someone connected it to 230V or an other high voltage source. A lot of dead parts. I demonstrate some alternative ways of short finding using a fluxgate probe and using a temperature meter. The other one was dead too, but I think someone tried to repair it because the display flex cable was torn. I repaired this but it had more issues. The total video is a small part of the total repair. There are no manuals, the PCB’ s are glued together, signals go from board to board and back and you can not reach them while clicked together. Things like the flex repair are very difficult and time consuming. 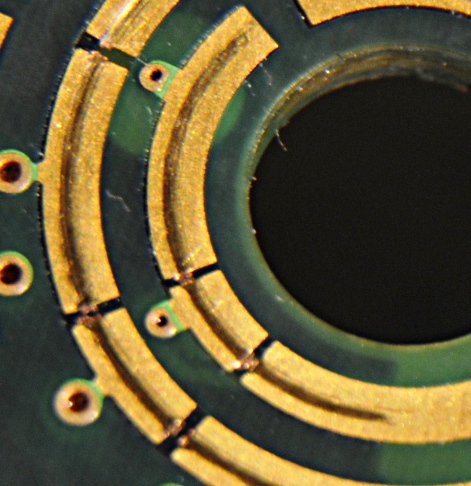 Often just one or two parts are dead, finding them without schematics can be a challenge. In the fried one, a lot of parts were dead. And this was “easy” because I was lucky a second dead one was send in just after I started with the first. Now I could compare and swap some things as a test. Together it was 10 hours of work. This instrument had a missing power supply input connector, a problem with the power button , a battery problem and someone had been inside it and killed the antenna. 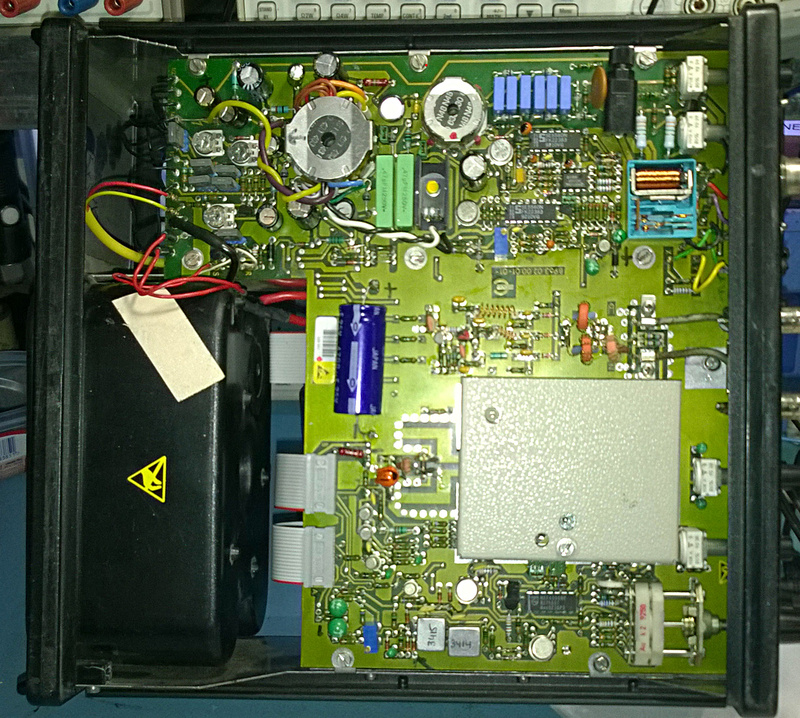 I repaired the antenna, modified the powerbutton, rebuild the solder pads of the power supply connector and fooled the BMS to get it out of sleep mode. This one came by mail from France. The problem was a dead transistor that is needed for the turbos. Because the car was in France I needed a way to bench-test it. I wrote some code for my Easy-pic development board that emulates the signals from the crankshaft and camshaft sensors. Two of these meters came in for repair. Someone already did his best to make the problem bigger. The first one had a problem with the function switch. It would not select a function. The cause was a man made problem. 2 resistors from the function voltage divider escaped. They were ripped from the pads. Probably when someone tried to remove the switch deck C ring. Number 2 was way off and had unstable readings. After placing new resistors the measurements were also on number 1 very unstable. The cause was hidden under the switch deck. I found it thanks to the microscope. The space between the tracks was filled with metal dust from the switch. It stayed there thanks to the grease they used to lubricate the switch. This caused leakage current. After cleaning they were way off so probably someone first tried to adjust things. They contain no special parts, except maybe the processor (that is placed out of sight under the display.) 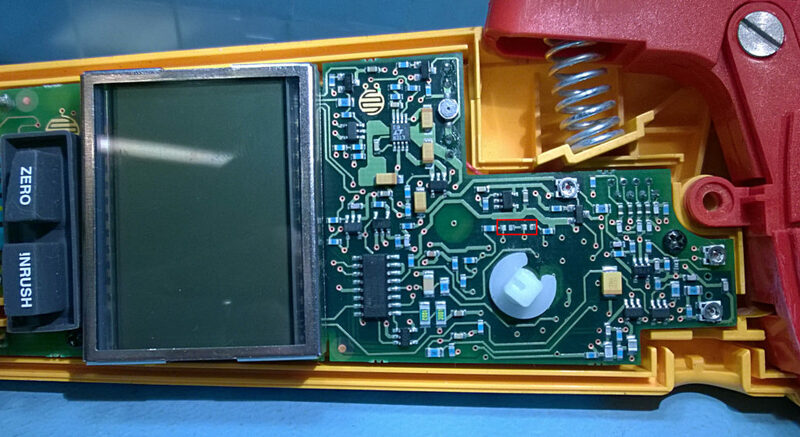 According to Fluke they are not repairable because there are no parts available. Adjusting them is not to difficult. Only the AC current is a bit a hassle. The trimpot is placed on the back and accessible via the battery cover. But not with the batteries installed. To make a big enough current you need something like a Fluke 5500 coil. You feed it with 10A. 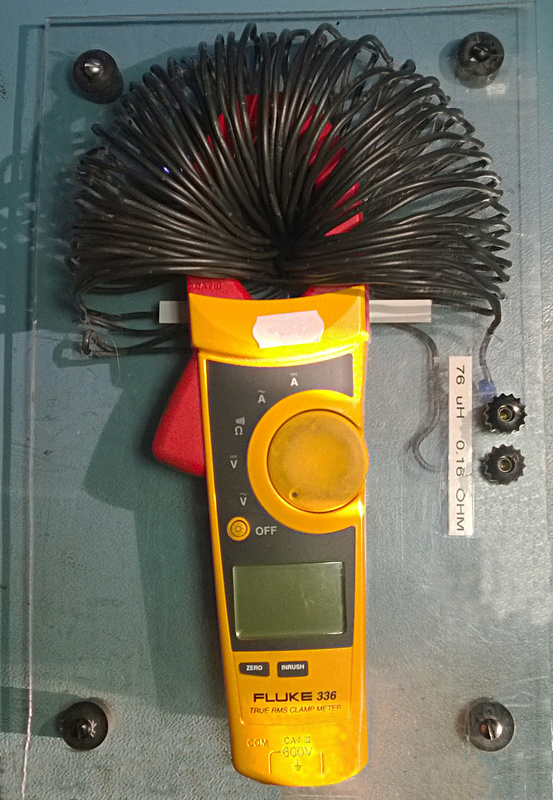 Because it has 50 windings all going through the clamp, the meter sees 500A. I have made my own version on a perplex plate so I can place the meter on it’s display and the clamp is still at the optimal centered place. That way the trimpot is accessible (without the batteries so I feed it with a lab supply. ) and I can see the display. Dit is een Time Domain Reflection “meter”. Het is eigenlijk een scoop en pulsgenerator in een behuizing. De puls wordt in een kabel gestuurd en het scoopdeel kijkt of er een reflectie is en geeft dat weer op het scherm. De tijd tussen puls en reflectie is om te rekenen naar afstand. Een open geeft een tegen gestelde reflectie. Net als op de foto hierboven. Een short geeft een reflectie met de zelfde polariteit als de puls. Een correcte afsluiting geeft een perfect vlakke lijn omdat er dan geen reflecties zijn. Ook onregelmatigheden zie je terug. Deze TDR is bedoeld voor meting aan kabels in industrie/bouw maar het soort meting wordt voor diverse andere toepassingen gebruikt. Veel moderne VNA’s hebben TDR ingebouwd. Er zijn er die afstanden van minder dan een mm kunnen meten, of de dikte van een vloeistof die drijft op een andere vloeistof. Het concept bestaat al sinds de jaren 60. Ik heb er ooit een gebruikt om een defect kerstboomlampje te vinden. Deze was nogal dood. Hij stierf in actie met rooksignalen. Er zijn geen schemas te vinden wat het een stuk lastiger maakt. Hij bestaat uit 4 delen. Een voeding en analoog signaal pcb, een digitaal pcb en een pcb wat oa de sweep opwekt. En natuurlijk de beeldbuis. In de voeding was een transistor en 2 tantalen overleden. In het sweepboard het IC wat de sweep maakt. In het digitale pcb een hele rits tantalen die af en toe doorsloegen. Verder nog wat verbrande weerstanden. Ook de voeding adapter deed het niet meer. This is the ignition controller from an 80’s Maserati 430 Biturbo. Not something you see every day. Someone else tried to fix it but gave up. The problem according him was a burned resistor and transistor. He removed the resistor with some pcb damage and desoldered partly the transistor. The via was still on the desoldered resistor leg. The resistor was a 0,09 ohm and I think somewhere between 2 to 5W. Not a value that is easy to find, but I found a 5W 0,1 ohm that measured 0,09 ohm. Because the original via was gone and the resistor longer I made a new hole and soldered the leg on both sides to the pcb. Besides that I also made a new connection instead of the original via. Just to be sure. The original “dead” one was a bit roasted but still OK. So this was not the problem. Also the 2 darlingtons were OK. Tested them on my curvetracer to be sure. The transistors are not parallel or in serie. Each one drives it’s own ignition coil. The problem was a dead voltage regulator. An ultra lowdrop 5V automotive version. Some of the electronics had a 6V max. The rest of the damage was less as I expected. 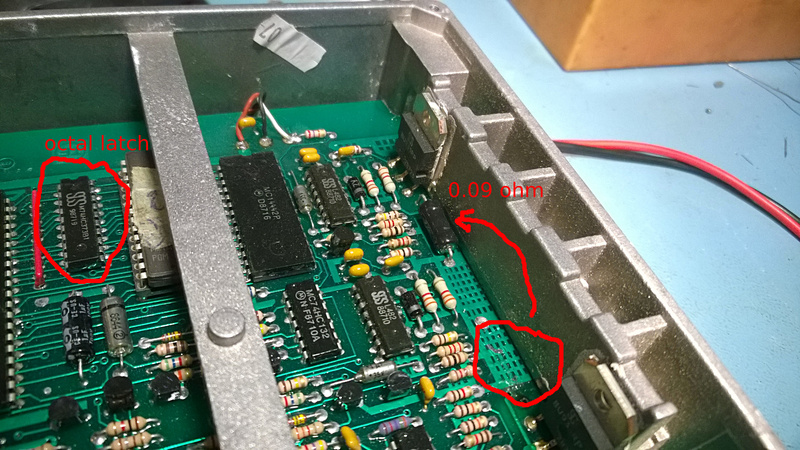 I was a bit afraid the eprom was damaged. But it tested Ok and I copied the code for safety. 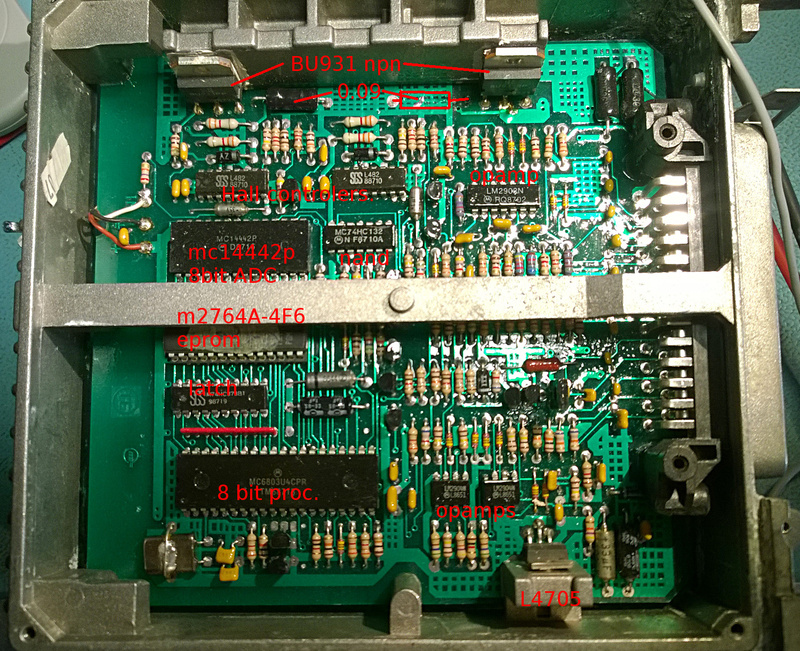 The eprom was probably protected by a 74HC373 octal latch that turned out to be dead. So he died not for nothing, RIP little chip. 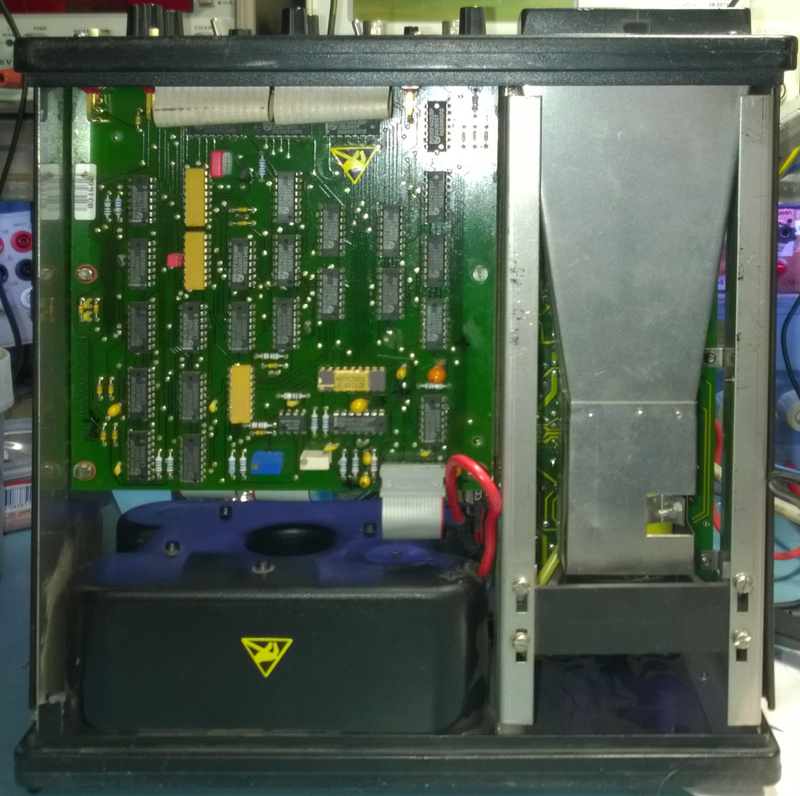 After checking and correcting bad solder joints and with a temporary 5V regulator it went back to the owner to check. And it worked. In the mean time the right regulator was delivered and I swapped it for the temporary 7805. 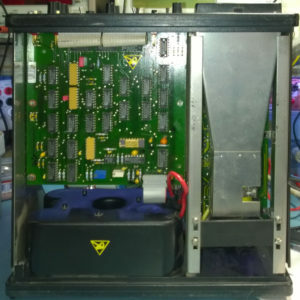 The unit has a microcontroller with an eprom and latch. They control the L482 Hall effect pickup ignition controllers. The latter each control a darlingtons that switches an ignition coil. There is a vacuum switch (I think) in the cabinet that connects to the 3 wires on the left. For the rest some opamps and a few nand gates. There is a conformal coating over de board.